Since its inception in 2001, SharePoint has been the leading collaborative content management platform. Known for providing enterprises with a wide spectrum of services, Microsoft SharePoint is the go-to for document storage and management, internal collaboration and communications, business intelligence, and workflow management tools. SharePoint Team Services (STS) for team collaboration. SharePoint Portal Server (SPS) for document search and management. Microsoft decided to combine those two products and released the SharePoint Portal Server 2003 (SPS 2003) as the commercial edition. SharePoint underwent a major design overhaul. Iconography was used across the site, and search controls became more efficient. Microsoft Office SharePoint Server 2007 (MOSS 2007) was released as the commercial edition and it provided a better integration with Office. A free edition (Windows SharePoint Services) was also available. SharePoint began to offer the ability to create and publish both master pages and page layouts. Exciting new features revolving around social networking were released. Applications were integrated with the rest of Microsoft Office. Improvements with enterprise connectivity and workflow management were implemented. The ability to use the latest versions of Office products. The cloud-based solution on offer. SharePoint 2013 provided a better user interface than the previous version. Branded sites became more extendable, allowing the focus to shift towards social connections, mobility, communities, and apps. OneDrive for Business grew in popularity as a storage solution. Social connections and project management became the focus. SharePoint 2016 is very similar to SharePoint 2013 in terms of UI, but the main improvement is its hybrid environment that allows it to integrate an on-premise farm with Office 365. The mobile experience was improved. Microsoft’s Project Server feature was made available with this version. Large files were supported (larger than 2,047MB). SharePoint Online has improved with the modern user experience. Team Sites were created to connect individuals with shared relevant content, frequently searched information, and often-used apps. Home pages are more engaging thanks to a personalized SharePoint search. Larger files are supported, and some character restrictions were removed to allow for more personalized file/folder names in document libraries. This version of SharePoint provides better accessibility with a mobile-friendly environment that allows users to communicate within their respective teams and organizations wherever and whenever. 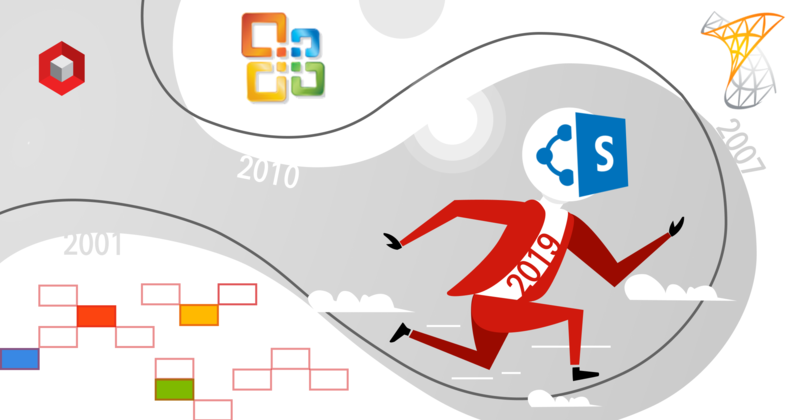 SharePoint 2019 is an on-premises version focusing on the modern user experience. The idea is to provide all the best qualities of SharePoint Online to on-premises users. SharePoint Spaces was announced by Microsoft, which allows users to interact with template content with a point-and-click process. It essentially utilizes virtual reality (VR) technology. SharePoint’s mobile application makes the intranet more accessible. Even larger files are now supported (up to 15GB). This version maintains the ability to create hybrid environments.